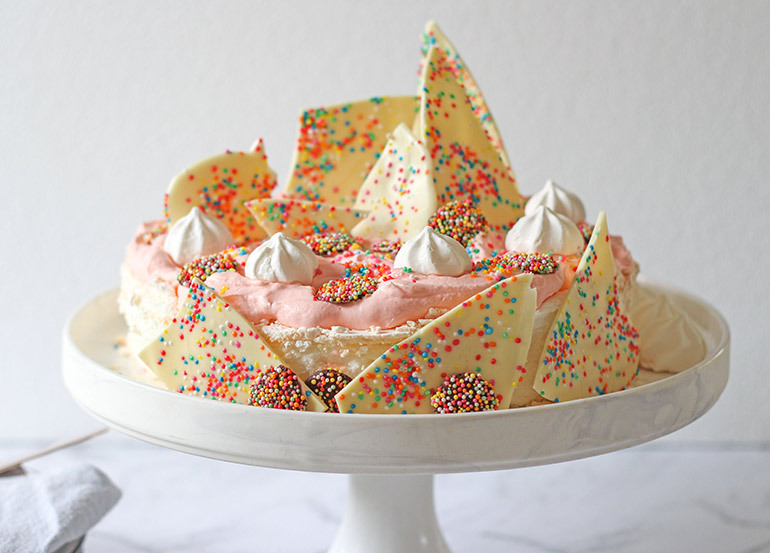 5 Decadent Ways to Decorate Pavlova from Start to Finish in Under 15 Minutes! The unsung hero of a dessert table and most definitely a crowd pleaser, the pavlova holds a special place in my heart (and my stomach) at Christmas. You see, the thing about pavlova is this. As delicious as it is, it takes quite a while to cook. And not everyone has the time (especially in the crazy lead up to Christmas) to bake all of that meringue goodness. Good news, folks! 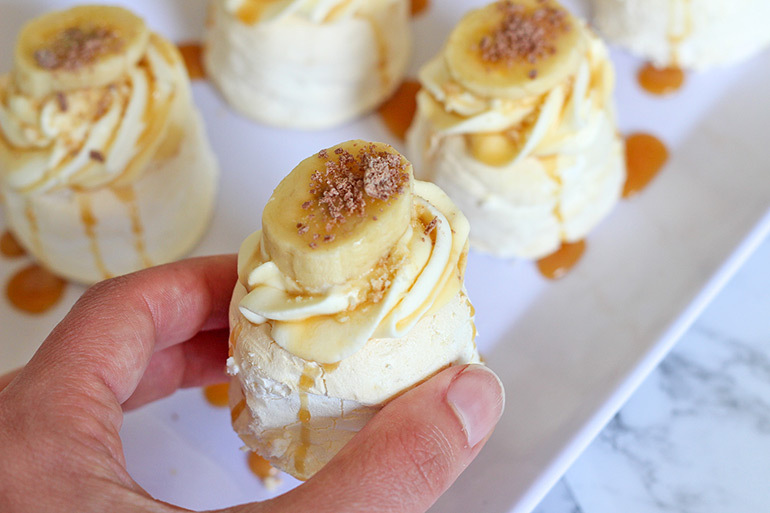 You can have a pavlova dessert on the table in less than 15 minutes with these time savers! I’m all for a good culinary cheat, and no lack of time will stop me from putting my best pavlova plate forward on Christmas Day. So what to do to protect my self-proclaimed reign as pav Queen? Head straight to Woolworths, that’s what. You know the drill – soft pillowy marshmallow centre and crispy outer – pavlova is perfect every time with Woolworths. 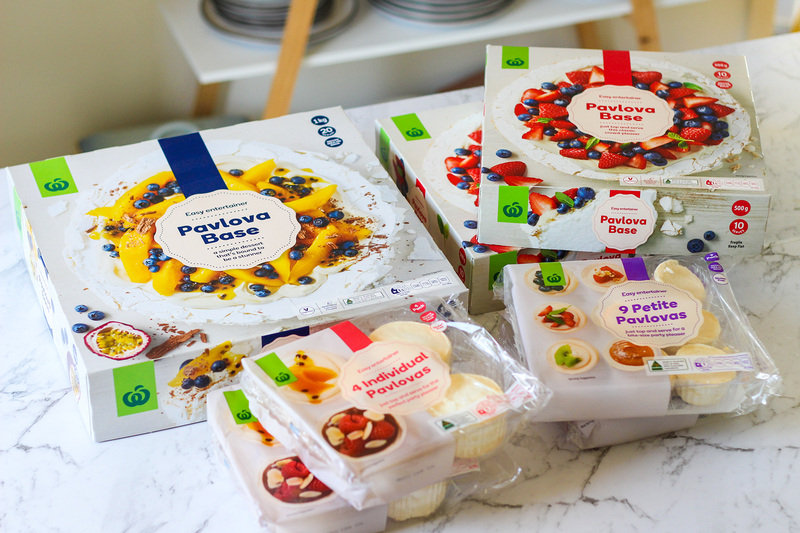 The ultimate short cut in creating a scrumptious pavlova, Woolworths has ALL of our pavlova needs sorted with their extensive range of pavlova bases. From a full crowd catering 1kg Pavlova Base ($12, serves 20!) to the dessert canapé style Petite Pavlovas ($5 for 9 minis), each and every one of them tastes like you’ve whipped those egg whites into submission yourself. So here’s FIVE ways (complete with how-to recipes!) to build on ready-made meringue bases to create truly epic pavlova desserts. WATCH: See for yourself below how quickly the kids Hundreds and Thousands pavlova comes together! 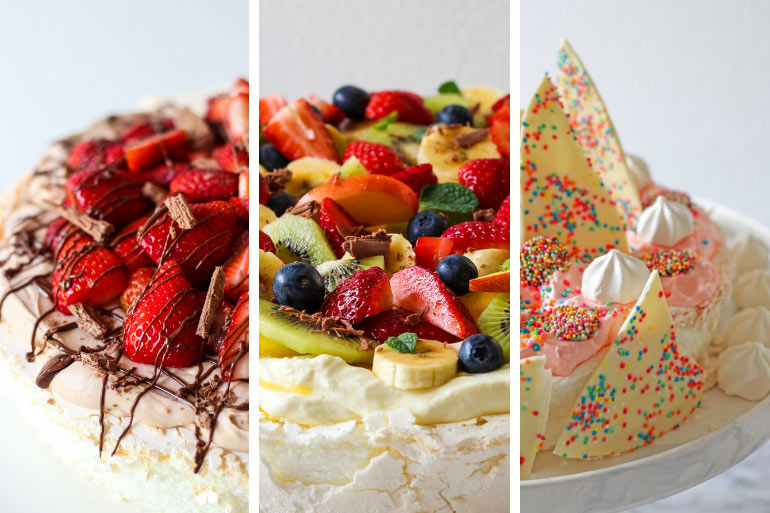 Pavlova Perfection 5 Ways! Let Us Show You How It's Done! 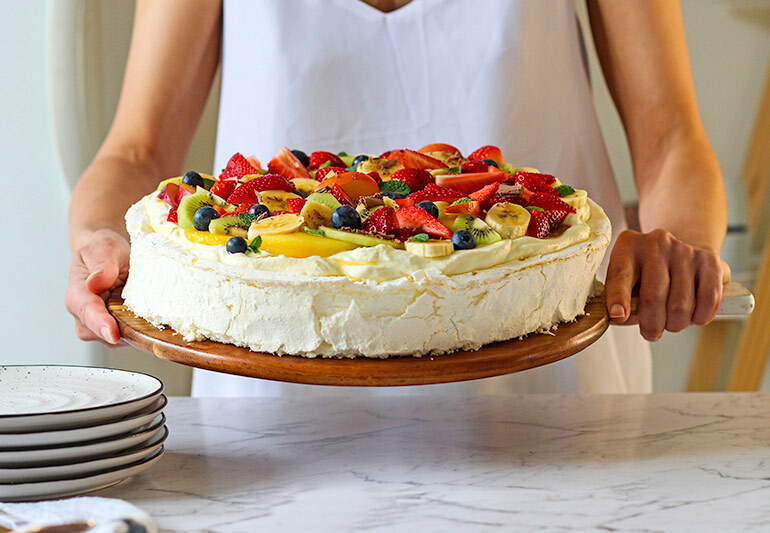 It’s the standard pavlova get-up, but there’s good reason people keep coming back to this staple when they decorate pavlova. It is after all, a mouth-watering fruit salad with all the trimmings. The trimmings being a wedge of spongy meringue goodness, of course. 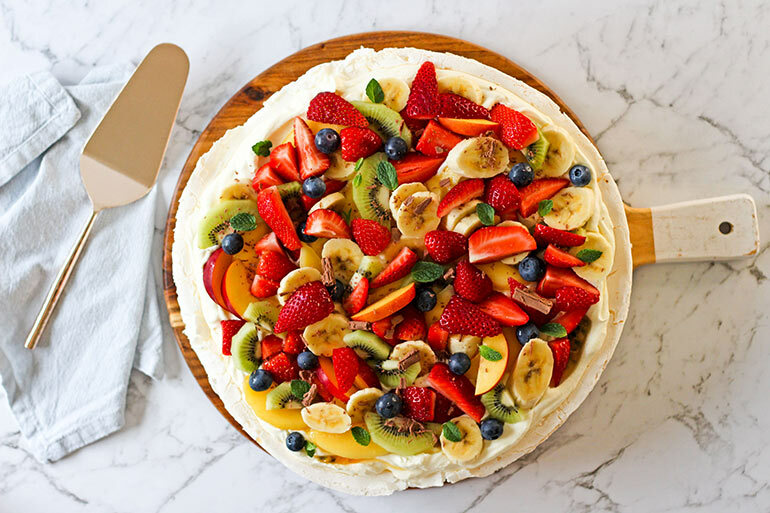 Celebrate ALL the in-season fruit and feed a crowd with the HUGE 1kg Woolworths Pavlova Base ($12). Banana, caramel and cream is already a winning combination. But when that winning combo is married with pavlova, it’s a match made in Heaven. 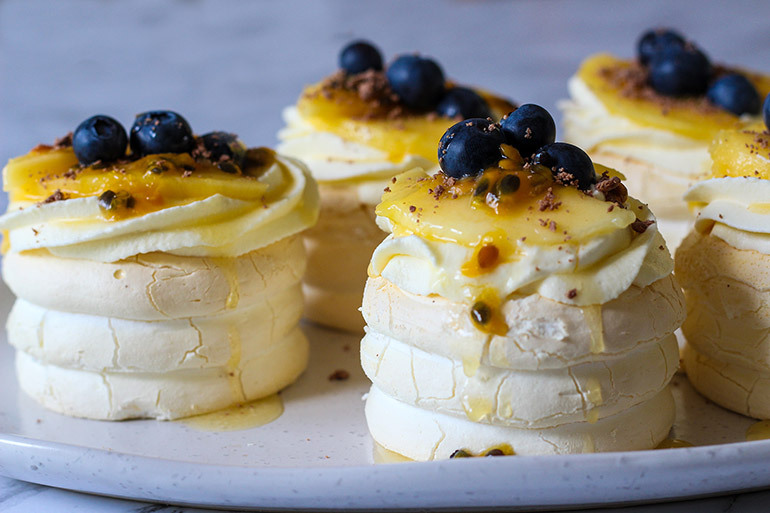 Woolworths Petite Pavlovas ($5) are not only super cute, they’re great for grazing boards and entertaining – plus they’re a cinch to decorate in a hurry! 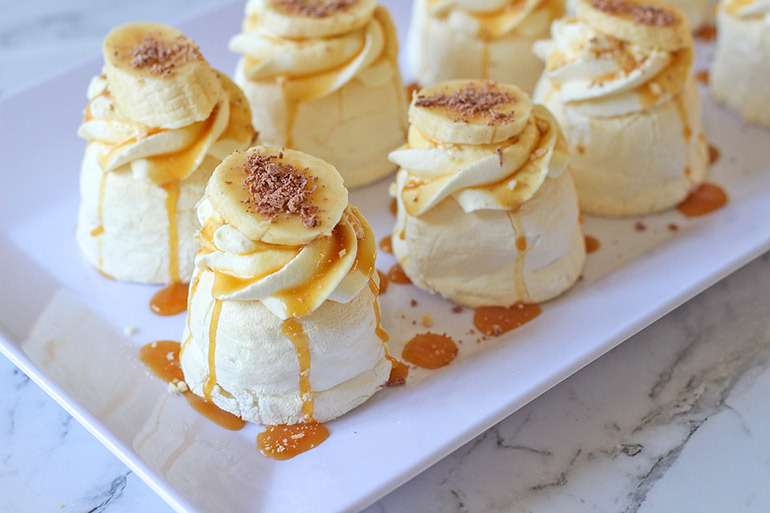 Place the individual pavlovas on the plate you intend to serve them on. Using an electric mixer, whip the cream at a medium to high speed until stiff peaks form. Spoon or pipe 2 heaped tablespoons of cream on top of each mini pavlova. Drizzle each cream topped pavlova with the caramel sauce, letting it run down the sides a little for a super indulgent treat. Sprinkle with biscuit crumbs and gently push a slice of banana on top so that the cream holds it. Top with the flaked chocolate and serve. Yum! There’s no fighting over who gets a bigger/ crunchier/ softer/ creamier piece of pavlova when everyone has their VERY OWN PAVLOVA. You can create perfect individual meringue nests for everyone using Woolworths Individual Pavlovas ($5). We’ve used them here to celebrate the season’s amazing mango and blueberries with a touch of tangy passionfruit. Deeeelicious. Place the individual pavlovas on the platter (or plates) you intend to serve them on. Using an electric mixer, whip the cream at a medium to high speed until stiff peaks form. Spoon or pipe 3-4 heaped tablespoons of cream on top of each individual pavlova. Using a teaspoon, drizzle a little of the passionfruit pulp over the cream. 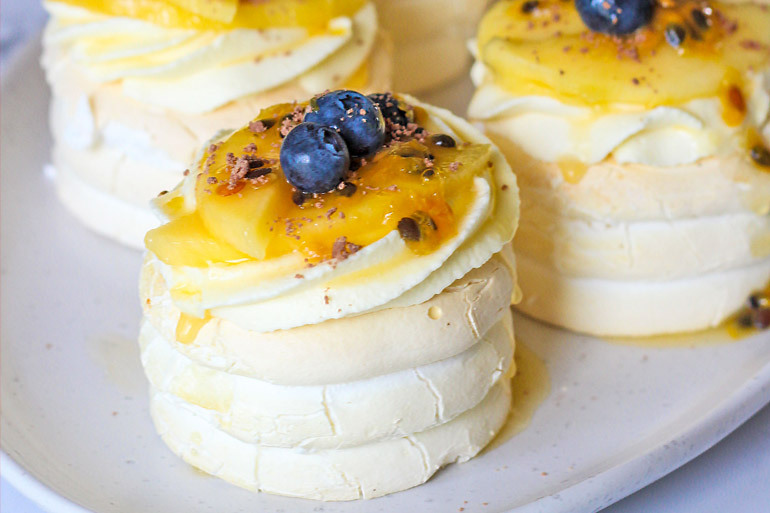 Decorate pavlova with slices of mango and push blueberries lightly into the cream to stay in place. Top with a little extra passionfruit pulp and flaked chocolate (if using). 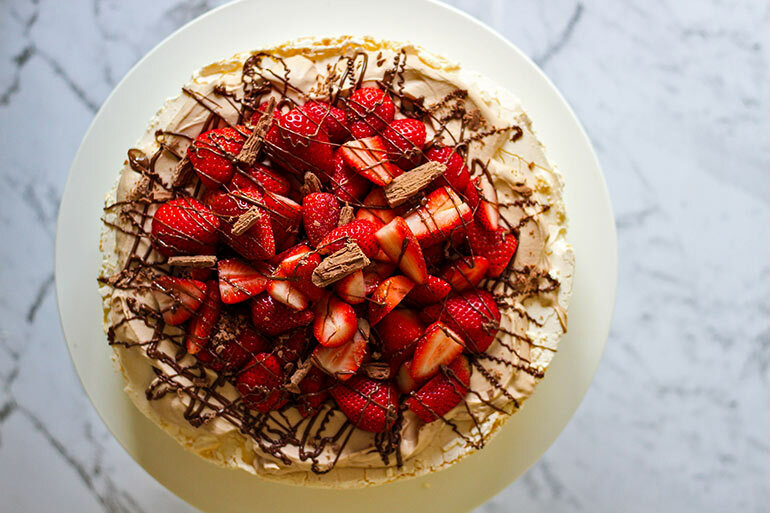 Here’s a pavlova for the chocolate hazelnut spread loving people in your life! 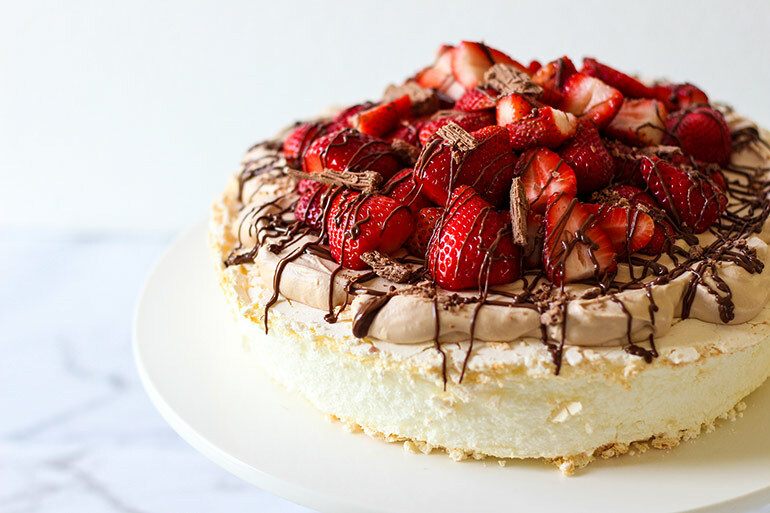 That sweet Nutella drizzle combined with sweet and tart strawberries on a cloud of fluffy Nutella flavoured cream and soft meringue is an epic dessert people will talk about until NEXT Christmas. Promise. The Woolworths Pavlova Base 500g ($6) serves 10 (or a family of five can go back for seconds). Place the pavlova on the platter you intend to serve on. In a large bowl, combine the cream and the just-warm Nutella. Using an electric mixer, whip the cream and Nutella at a medium to high speed until stiff peaks form. Spoon the Nutella cream over the surface of the pavlova base. Drizzle the cream with a little extra Nutella. Spread the strawberries over the top of the cream, building a slight peak in the middle. Drizzle generously again with the warm Nutella and top with flaked chocolate. Serve immediately and prepare to wow your guests! Top Tip: Drizzle warm Nutella easily by spooning it into a zip-lock bag and snipping a tiny corner to release it. Easy! If ever there was a fun pavlova ESPECIALLY for the kids, this has to be it. In fact, the kids can even make it themselves and have a blast in the kitchen, decorating a Woolworths Pavlova Base 500g ($6). 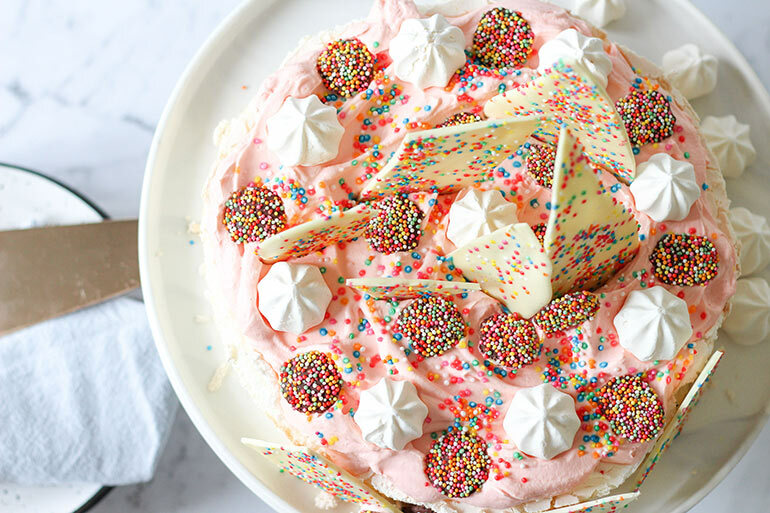 Celebrating all things colourful and full of sugar, we give you the hundreds and thousands pav! Line a small tray or plate with baking paper and put it in the freezer so it’s cold! Break up the white chocolate into a microwave safe bowl, remove four pieces and set aside. Using the microwave, melt the chocolate in 20 second blasts on high, stirring between each burst until smooth. Add the reserved pieces back in and stir until smooth again. Spoon the chocolate onto your prepared tray, spreading it out slightly and sprinkle with hundreds and thousands. Return it to the fridge to set. In a large bowl, combine the cream with a couple drops of food colouring. Using an electric mixer, whip the cream at a medium to high speed until stiff peaks form. Spoon on top of the pavlova base and spread to cover. Now the decorating fun begins! Sprinkle the cream with hundreds and thousands, place mini meringues and Freckles chocolates on top and around the sides. Tip: use leftover whipped cream to glue into place. Once the chocolate sheet is set (it doesn’t take long to set – around 10 minutes), break up into shards and gently place them into the cream and around the pavlova base. Talk about an epic pavlova! Serve immediately. Create ‘waves’ in your whipped cream with the edge of your spoon or spatula. It’s a great way to catch fruit pulps, toppings or jams for extra flavour! Save the crumbly bits of meringue that might fall off as you take the packaging off. Tip them into a bowl and add them to the top of your pavlova for added crunch. Gently does it. Remember meringue is fragile! Be careful in handling it and remember lots of too-heavy toppings may result in a sinking pav. It’ll still be delicious – just flatter. Put your best (super quick) dessert making foot forward this Christmas (and any other day of the year!) by heading to Woolworths for all of your meringue and pavlova building needs!